↑ Genzlinger, Neil (September 18, 2017). "Bobby Heenan, Professional Wrestling Personality, Dies at 72". New York Times. 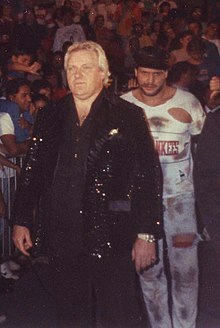 ↑ 2.0 2.1 2.2 "Bobby Heenan's SLAM! Profile". SLAM! Sports. สืบค้นเมื่อ August 24, 2007. ↑ 3.0 3.1 "Bobby Heenan's OWW Profile". Online World of Wrestling. สืบค้นเมื่อ August 24, 2007. ↑ "WWE Hall of Famer Bobby "The Brain" Heenan passes away". WWE. สืบค้นเมื่อ September 17, 2017. ↑ 6.0 6.1 Guzzo, Paul (September 17, 2017). "Wrestling star Bobby "The Brain" Heenan of Largo is dead at 72". Tampa Bay Times. สืบค้นเมื่อ September 25, 2017. หน้านี้แก้ไขล่าสุดเมื่อวันที่ 4 พฤศจิกายน 2560 เวลา 23:33 น.